Senior Enlisted Leaders (SEL) in the U.S. Armed Forces are high ranking enlisted service members that form the critical link between the enlisted service men and women and their commanding officer. 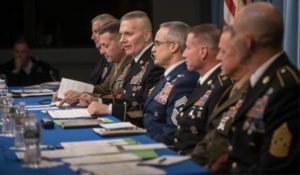 Senior Enlisted Leaders often hold the military paygrade of E-9 and above and are responsible for keeping the commanding officer and/or executive officer informed about issues or developments within the enlisted workforce. Senior Enlisted Leaders are responsible for communicating the commander’s directives to the enlisted service members while also serving as the senior representative for enlisted views and concerns. SEL’s enhance communication within the chain of command by ensuring that enlisted service members understand the goals and directives issued from the commanding officer while also providing enlisted members an avenue to express warranted views and concerns up the chain of command. This level of communication and visibility by SEL’s in partnership with their commanding officer ensures that commands are continuously improving. SEL’s can also be responsible for communicating policies, programs, and opportunities that allow enlisted service members to enhance their careers or well-being. This allows the enlisted personnel to focus on the mission since SEL’s ensure that enlisted men and woman are supported and have the tools and skills needed to accomplish their mission. One of the greatest benefits of SEL’s is to bring insight to the commanding officer about their understanding of the enlisted workforce. All SEL’s started their military career as junior enlisted service men or women and have worked their way up through the ranks. In the military there are significant differences between rising through the officer ranks versus the enlisted ranks. SEL’s bring this insight to their commanding officers so that CO’s can make informed decisions regarding their command and can gain an understanding of the men and woman who make up the enlisted members of their command. SEL’s report directly to their commanding officers and are accountable for reporting on sensitive or current issues within the command. In order to successfully gather this type of information, SEL’s are very visible within the command and spend a significant amount of time visiting and talking with enlisted personnel as much as possible. Often, SEL’s will spend time walking around the base or command and will speak with other enlisted personnel giving them the opportunity to discuss current issues or events within the command. This information is then relayed to the commanding officer and allows senior leadership to find out if there are problems that need addressed without having to make a formal inquiry. This inclusive approach to communication help to prevent certain problems before they would occur within the command. Another responsibility of SEL’s is to ensure that communication up and down the chain of command remains open, effective, and efficient. The SEL is accountable for the good order and discipline of the command and oversees the welfare, training, and morale of service members within the command. In addition, SEL’s are often called on to participate in certain ceremonies such as reenlistment ceremonies or award ceremonies. SEL’s are a critical component in any U.S. military command. They provide a link between the enlisted ranks and the commanding officer ensuring effective communication up and down the chain of command. SEL’s are also responsible for ensuring the welfare of the enlisted service men and women placed under their charge. SEL’s hold high-ranking positions within the command and have high levels of accountability and responsibility.